You have just created an outline for your new blog and chosen a blogging platform, what’s next? Well, one of the most important steps you need to take is coming up with a good blog name. To help you with the task, you can utilize a blog name generator. In this article, we will go through a list of the best blog name generators of 2019. Why do Blog Names Matter? Before discussing it further, let us explain what a blog name generator is. It’s an online tool that creates and suggests unique blog names based on the words that you’ve typed in. Some also check if the name you chose is available as a domain. It’s just a name, why take it so seriously? Your blog name is your online identity, naming your blog or website is as important as choosing a name for a new company. If you want your career to grow from a casual blogger to something much more professional, then you need a name that is one of a kind, but easy to remember. A few examples of successful blogs with unique names are Dooce, Everyday Carry, and The Everywhereist. To come up with names that are eccentric and quirky like that is not easy. You can lose precious time brainstorming. But with a blog name generator, loads of suggestions are created in just a few seconds. There are two recognizable types of names used for both blog names and domains: names that are created based on brand and names that are made from keywords. Who hasn’t heard of Google, Amazon, and Facebook? They are a few of the most successful brand names online. The names are easy to recall, simple to spell and unique. Brand based names are usually created from coined words that are inspired by an event or a person. Sometimes it can also be a new way to say something like “netizens” or a random word. The name doesn’t have to be relevant or have meaning. If it sounds nice and catchy, it has the potential to grow and develop into a brand. Keywords are words or phrases that users type in a search bar when they are looking for specific information. For example, an avid reader will search “good books to read” when they are looking for new books to collect. “Good books to read” are keywords. Keyword-based names are created based on words related to the content that a user is putting out. If you’re starting a blog about reviewing songs, for example, you might name it Song Reviews 101 with the domain songsreviews101.net. If the domain isn’t available, you can play around with prefixes and suffixes to come up with variations. The reason why some users prefer a keyword-based name is because they can get an early start in search engines. People can easily find your blog if it has a name or domain that matches entirely or partially with top keywords. Whichever type of name you choose make sure that it is memorable, short and simple. You don’t want people to avoid your blog because it has a complicated name to spell or pronounce. Let us dive into the top online tools that can help you with choosing the perfect name for your blog. This blog name generator is a great little tool. It creates entertaining and original blog names that can put a smile to anyone’s face. The generator asks for details about the blog: everything from verbs, adjectives, names, to the place where you live. If you don’t want to type in any personal information, you can click on the Suggest button and the system will generate randomly for you. The suggestions list is the highlight of this tool; you will find classic formats, rhymes, even a selection of computer-generated puns. The number of suggestions is limited, and the generator doesn’t come with domain availability, but you might just come across the perfect name for your blog. However, you will need to use other online tools to check whether other publications are currently using the title or not. Nameboy is one of the oldest blog name generators on the web. It’s a straightforward tool where you type in one or two keywords, and it’ll show hundreds, even thousands of possible suggestions. For extensions, however, Nameboy does not offer other top-level domains except for .com. It also gives you the option to register your domain once you’ve found the right name for your blog by clicking the View Details button. Another blog name generator that can help you create a catchy name is Wordoid. It creates “wordoids” — made up catchy words. The generator has a smart interface that is easy for users to explore. 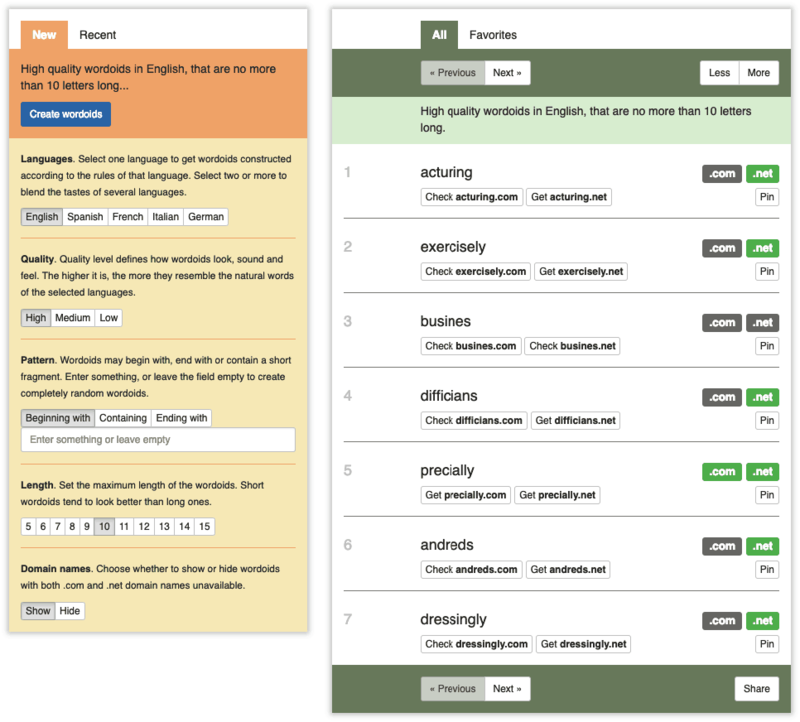 Wordoid supports five languages, English, German, Spanish, French and Italian. You can select more than one languages to blend them. There’s a quality level option that defines how the wordoids will look. You can choose from high, medium, and low. The higher the quality, the more natural the wordoid will be. The pattern of the wordoids is adjustable as well. You can make it begin, contain or end a specific word. As for the length, you can set the wordoid to a maximum of 15 and a minimum of 5 characters. Besides that, you can show or hide unavailable wordoids with .com and .net domains. Domain wheel is a free online tool that helps you look for suitable blog names, domains, as well as URLs. It has the option of adding one to several keywords, and the blog name generator will give you the best available options. By the Search Domain button, you’ll be able to filter your results according to the selected extensions. If the recommendations aren’t to your liking, you can check out the random ideas and suggestions as you scroll down. Domain wheel will also recommend words that rhyme and sound the same as your keywords. Once you’ve found a domain that you like, you can register it directly by clicking on the View Details button. Name Mesh is a popular blog name generator that is best to use if you have several keywords in mind. Simply enter one or more keywords into the search bar and click generate. Since they offer eight different categories, your results will appear for each one. Filtering the results by length and extensions in Name Mesh is possible. Other than that, you can pick which registrar you want for domain registration as well. The people behind Lean Domain Search are the ones who developed WordPress. The blog name generator is free to use and very simple. After entering your keywords and pressing search, expect thousands of available .com domain suggestions. You can sort the results by popularity, length, or alphabet. Other than that, you can also filter the names that start or ends with your search term. DomainsBot is a blog name generator that is very easy to use as it has a clean dashboard. Once you enter the keywords and click search, the system generates a list of available domain names with the option of registering them. On the left side of the interface, you’ll be able to polish your list by ticking on preferred filters. You can choose from top-level domains (TLD) to generic top-level domain (gTLD) extensions. With it’s appealing design, marvelous speed, and simplicity, Panabee is one of the most popular tools for generating blog name and domain suggestions. All you have to do is type in one or two words describing your content, and the system will process it for you. Panabee creates name ideas by merging the two keywords, eliminating or doubling letters, swapping related words. You can also change the domain extension to the one you want as it supports .com, .org, .net, .us, etc. and check their availability. What makes it different from the rest of the other name generators is that you can check if the name you picked is available across different social media platforms. This feature can be a big help if you want to grow your brand. Blog Title Generator by SEOpressor is more for content or blog title ideas than a tool for creating a domain or brand name. If you use WordPress, then you might be familiar with their premium plugin. The generator is free and provides tips on how to make winning headlines and attractive titles for your blog posts. NameStation is another popular blog name generator, however, it has a few limitations in its functionality. At the Keyword Domains Generator section in the Domains Search page, enter your keyword and let the system generate random domain names for you. Yes, random. The suggestions given are mostly your keyword added with irrelevant words that make little sense. The only feature that seems to attract users is the name contest. Registered accounts can enter a contest by posting domain name ideas for other users. Picking out a name for your blog is essential as it is a huge part of your online identity. You should create a brandable name if you’re planning to grow your blog into a business. If you want your blog to be SEO friendly, then a name based on keywords is advisable. Thinking about it can be a head-full, but with the help of blog name generators, you can slide through this crucial step with no problems. DomainWheel and Nameboy are minimalistic generators that are suitable for users who want a quick search. Users who wish to gain detailed results can try Wordoid, Name Mesh and Panabee. So take your time, get the help from the blog name generators and create a name that is unforgettable.